Almost everybody in the UK loves a Sunday roast. A Sunday roast usually consists of one meat with at least two types of vegetables plus gravy. The meat is normally beef, lamb, pork or chicken. 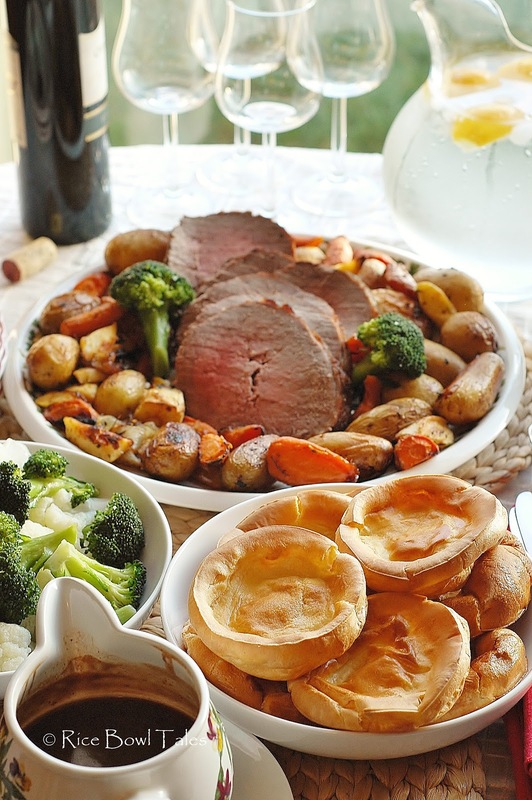 If cooking at home, I would say roast beef probably is the most popular; this may be because it traditionally is served with Yorkshire pudding, and Yorkshire puddings are loved by everybody. 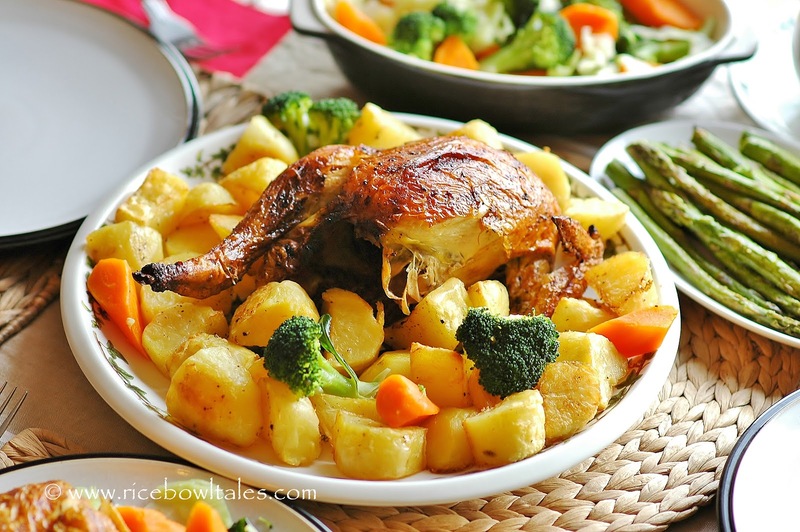 Roast chicken could well be the most common, simply because chicken is more affordable and the easiest to cook. 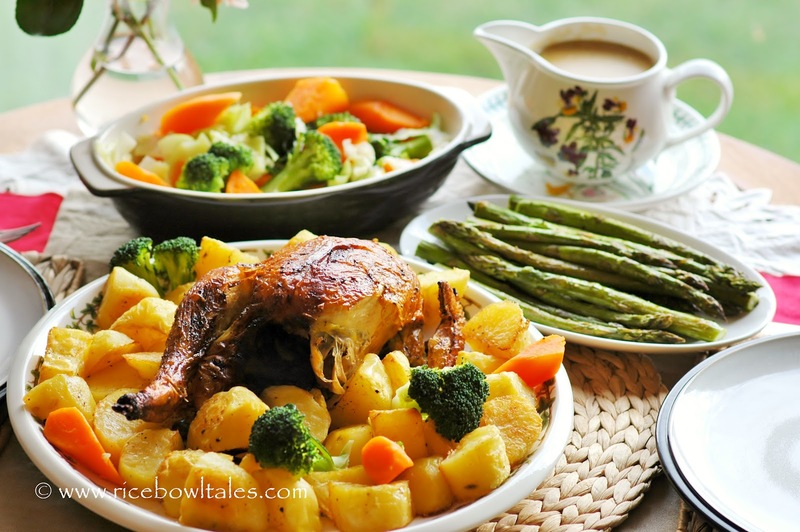 In fact, roast chicken are being served at home or in restaurants all through the week, whilst roast beef, lamb and pork are very likely only served on Sundays. 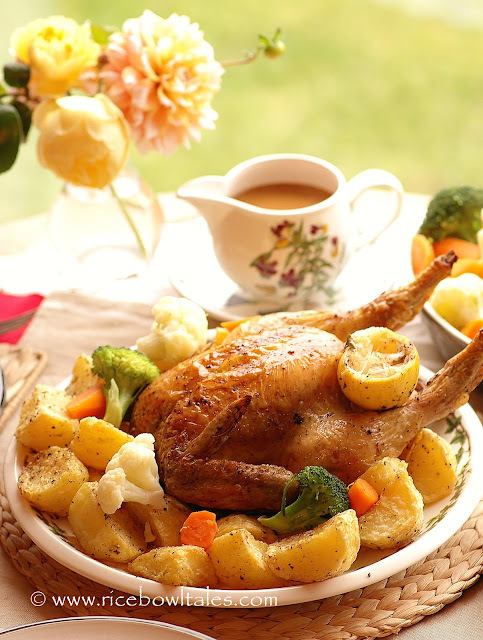 I love cooking roast chicken. There are so many ways to do it. 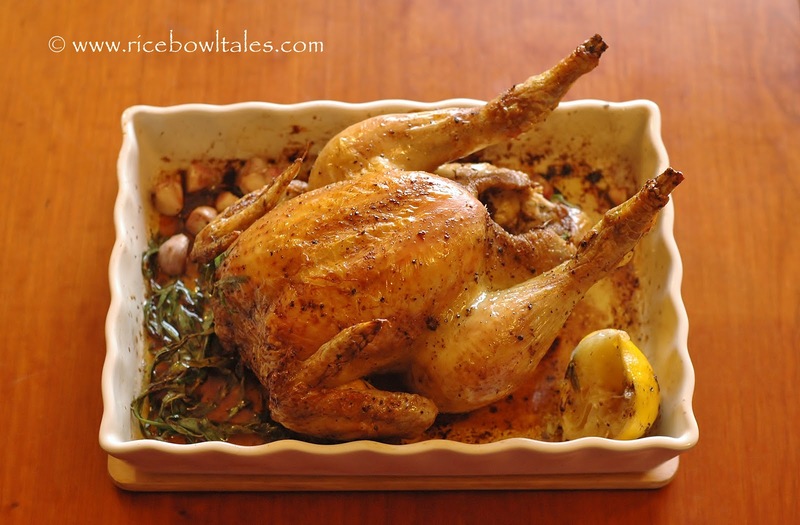 One of the most simple and delicious method is to roast it with Tarragon, garlic and lemon. And that is got to be one of our all-time favourites. Tarragon is a fresh herb that has an aromatic scent and flavour similar to anise. 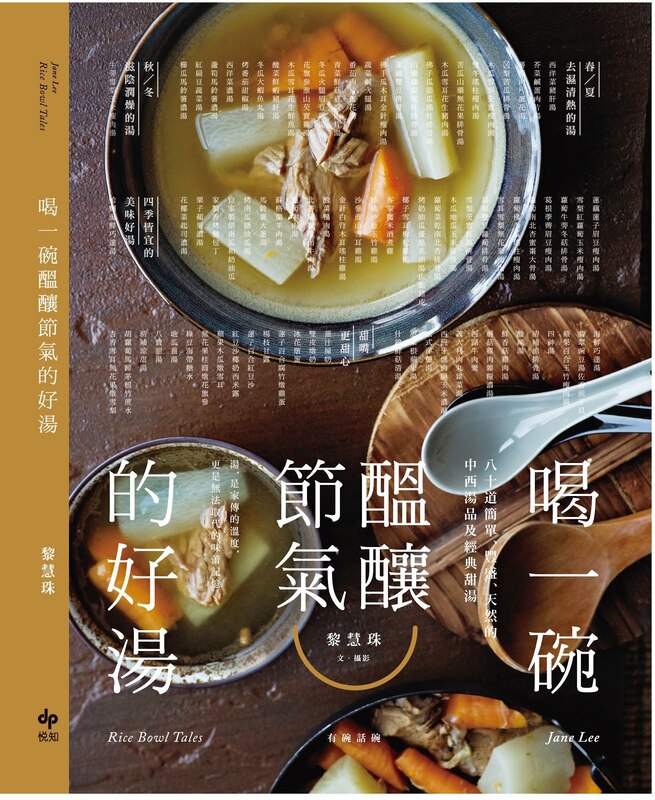 It goes very well with fish, chicken and egg dishes. If you can’t get hold of the fresh tarragon, you can use the dry herbs instead; alternatively, you can replace it with Rosemary if you can’t find both. Tarragon has a combination of many flavours, having a hint of mint, pine, pepper and hay with a slight bittersweet taste. 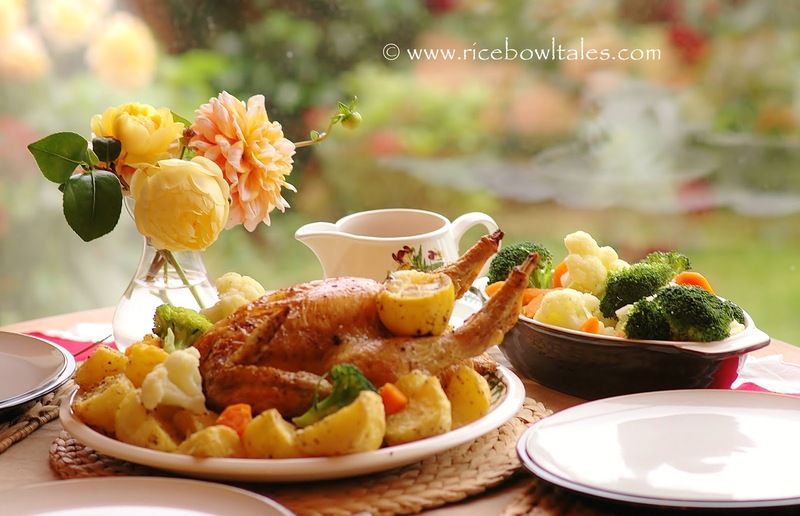 Cook it with garlic, wine and cream to produce a sauce to serve with the chicken, is like the icing on a cake. Last week, my daughter and I were very busy sorting out her things to take back to London. We didn’t have a lot of time to prepare dinner, so I cooked this roast chicken twice. And they were so delicious that I couldn’t wait to share the recipe with you. Preheat oven to 220C / 425F / Gas7. 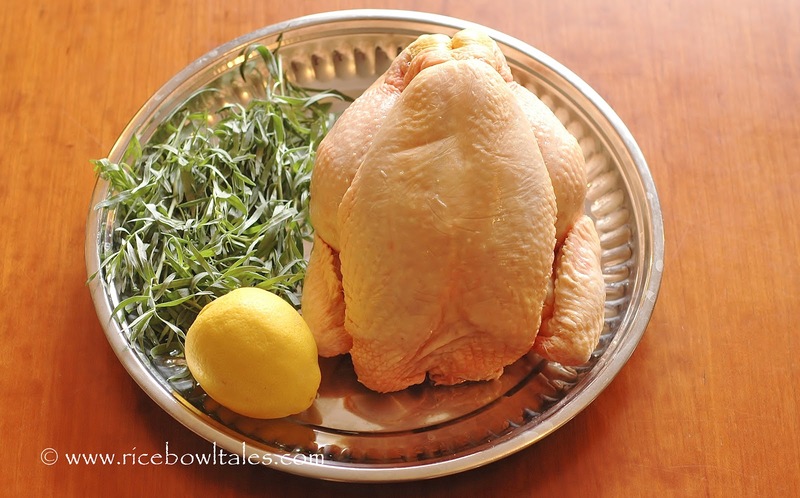 Season the chicken by spreading inside and out with freshly milled salt and pepper, half of the lemon juice and 1 tablespoon olive oil. 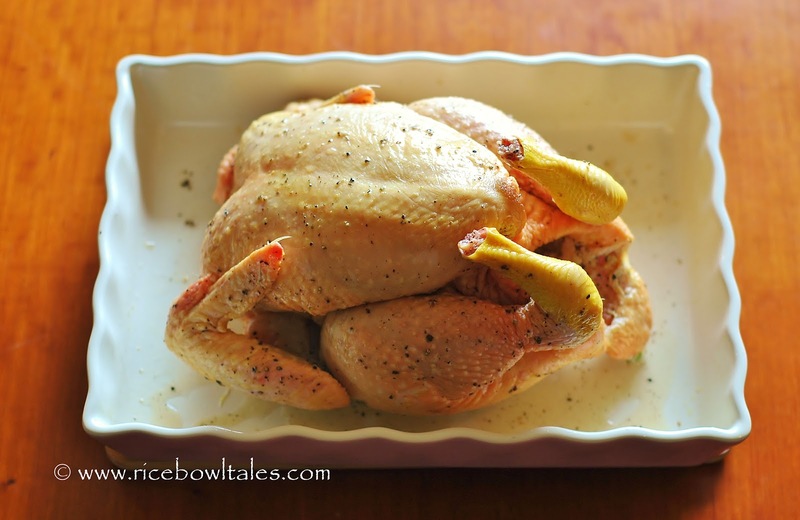 Put the 6 crushed garlic, 3 sprigs of the tarragon and the squeezed half lemon inside the chicken cavity. Place the chicken on a roasting dish or tin, cook in the preheated oven for 15 minutes, then take the chicken out to turn it over; lower the temperature to 180C / 350F / Gas4, and cook for 30 minutes. Turn it over again to cook for another 30 minutes ( altogether 1 hour 15 minutes ). Check the chicken is cooked through by inserting a sharp knife into the thickest part of the thigh - the juices should run clear. Minced the 2 cloves of garlic, heat a sauce pan with medium heat, add the 1 tablespoon of olive oil, then the garlic to stir-fry, take care not to burn them. Add the chopped 3 sprigs of tarragon to stir together, pour in the wine, bring to boil to reduce it by half. Add the stock and bring back to boil, squeeze in the juice of the remaining half lemon, add sugar, bring to boil again, stir in the double cream and boil until a satisfied consistency is reached. 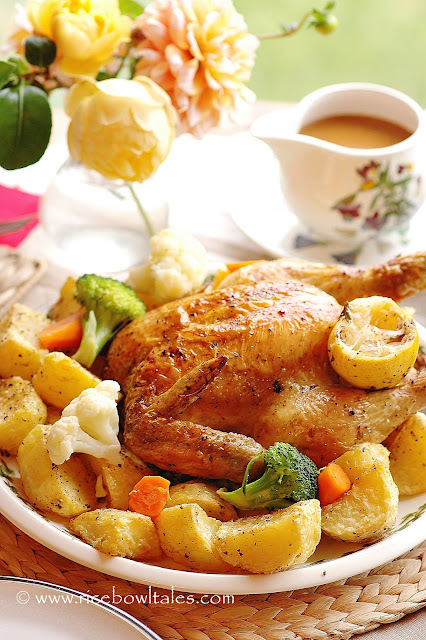 Sprinkle on some chopped tarragon and pour in a gravy jug, serve the chicken with the tarragon cream sauce. A delicious roast chicken with lemon & tarragon sauce, is so easily cooked. 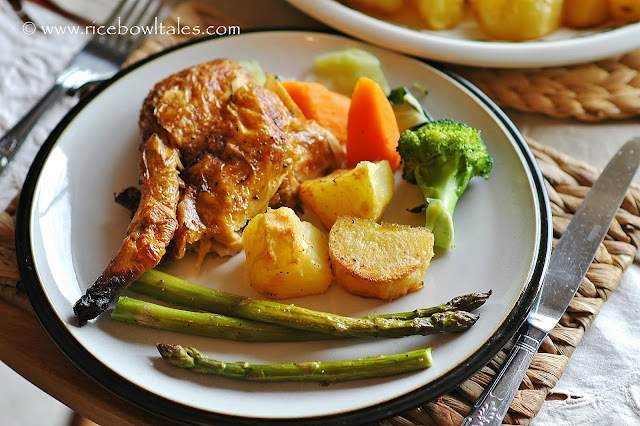 Served with roast potatoes and vegetables; such a simple yet scrumptious meal, you can cook it for your family any day of the week. 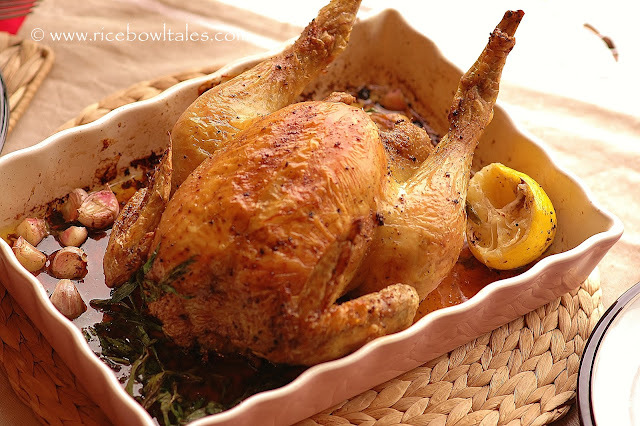 You remind me I have so long did not prepare roast chicken meal , usually I like to add Rosemary but next time if I can get Tarragon, sure I want to try. 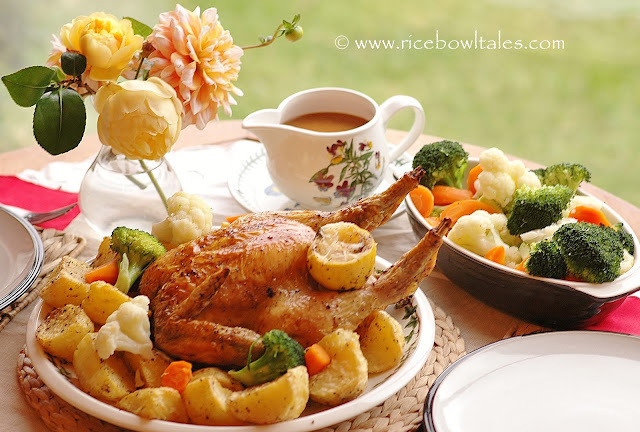 Your roast chicken look perfect golden brown, wish I can taste some now. 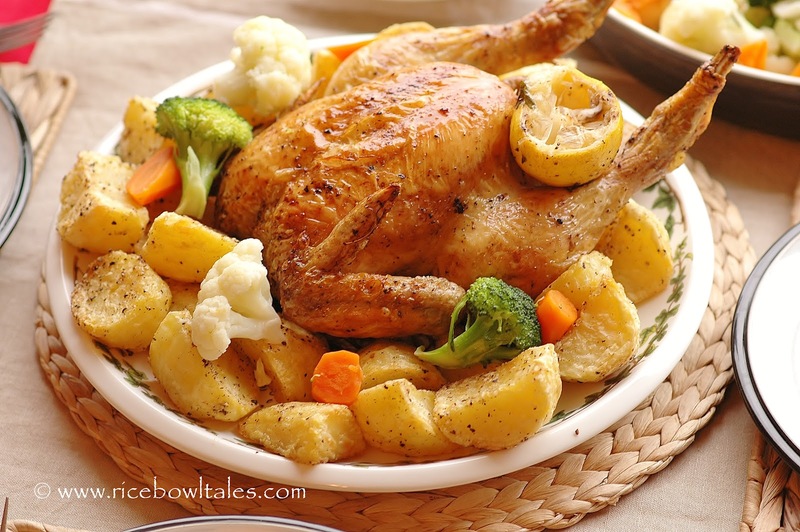 The Chicken looks soooo perfectly roasted. Too bad the other half doesn't eat Chicken so usually I could only make it for one, hence not the whole chicken. Maybe I shall use your recipe on a Chicken Maryland next time! 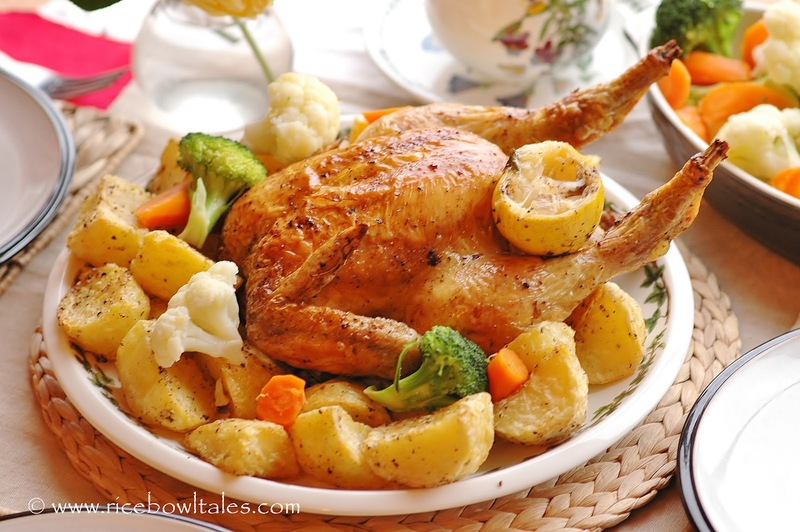 hi Jane, the roasted chicken came out great, juicy and tasty. my hubby and my daughter really like it! next time i will try with the fresh herbs. thanks for your inspiration. i served with some fried potatoes, simple stir-fried vega, prefer for our low fat intake meal. So glad to hear that the chicken turned out okay and that your family liked it! Thank you very much for letting me know. 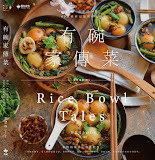 Hi, just came over from Kelly Siew's blog. 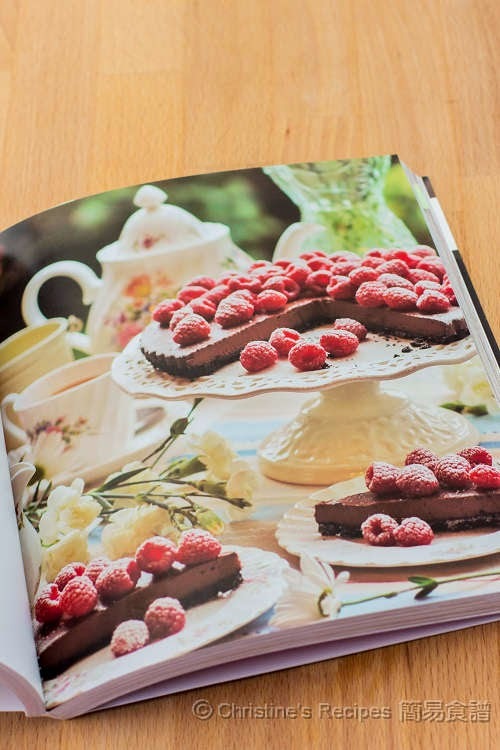 Wonderful recipes and gorgeous photos :) look forward to following your updates. 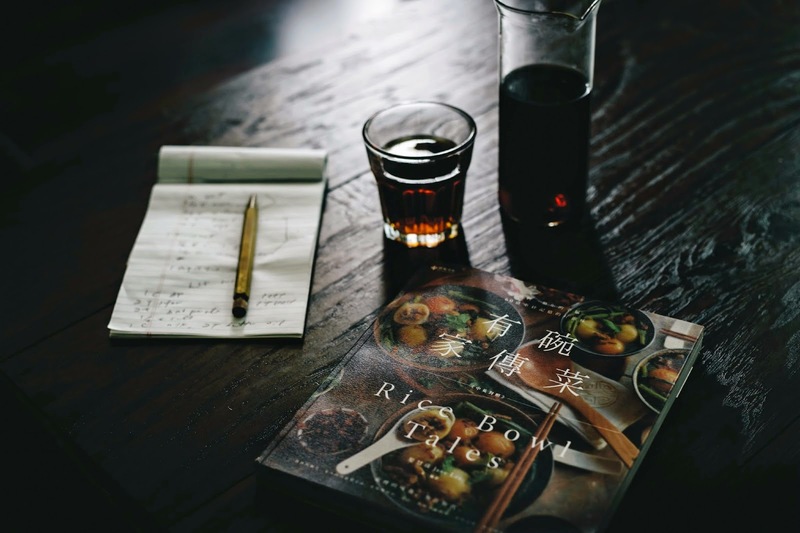 Just came back from your blog, great recipes! I will be making your chocolate sauce for my little nephew when he comes visiting next time!